The property font-family is used to set a prioritized list of fonts to be used to display a given element or web page. If the first font on the list is not installed on the computer used to access the site, the next font on the list will be tried until a suitable font is found. 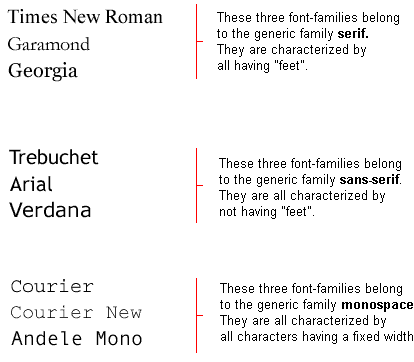 There are two types of names used to categorize fonts: family-names and generic families. The two terms are explained below. Examples of a family-name (often known as "font") can e.g. be "Arial", "Times New Roman" or "Tahoma". Generic families can best be described as groups of family-names with uniformed appearances. An example is sans-serif, which is a collection of fonts without "feet". When you list fonts for your web site, you naturally start with the most preferred font followed by some alternative fonts. It is recommended to complete the list with a generic font family. That way at least the page will be shown using a font of the same family if none of the specified fonts are available. Headlines marked with <h1> will be displayed using the font "Arial". If this font is not installed on the user's computer, "Verdana" will be used instead. If both these fonts are unavailable, a font from the sans-serif family will be used to show the headlines. Notice how the font name "Times New Roman" contains spaces and therefore is listed using quotation marks. The property font-style defines the chosen font either in normal, italic or oblique. In the example below, all headlines marked with <h2> will be shown in italics. If font-variant is set to small-caps and no small-caps font is available the browser will most likely show the text in uppercase instead. The property font-weight describes how bold or "heavy" a font should be presented. A font can either be normal or bold. Some browsers even support the use of numbers between 100-900 (in hundreds) to describe the weight of a font. The size of a font is set by the property font-size. There is one key difference between the four units above. The units 'px' and 'pt' make the font size absolute, while '%' and 'em' allow the user to adjust the font size as he/she see fit. Many users are disabled, elderly or simply suffer from poor vision or a monitor of bad quality. To make your website accessible for everybody, you should use adjustable units such as '%' or 'em'. Below you can see an illustration of how to adjust the text size in Mozilla Firefox and Internet Explorer. Try it yourself - neat feature, don't you think? Using the font short hand property it is possible to cover all the different font properties in one single property. You have now learned about some of the possibilities related to fonts. Remember that one of the major advantages of using CSS to specify fonts is that at any given time, you can change font on an entire website in just a few minutes. CSS saves time and makes your life easier. In the next lesson we will look at text.